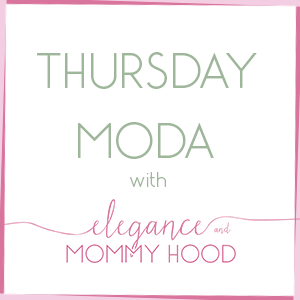 Thursday Moda #31 and Neutrals with Color Pops. Welcome to Thursday Moda Guys. 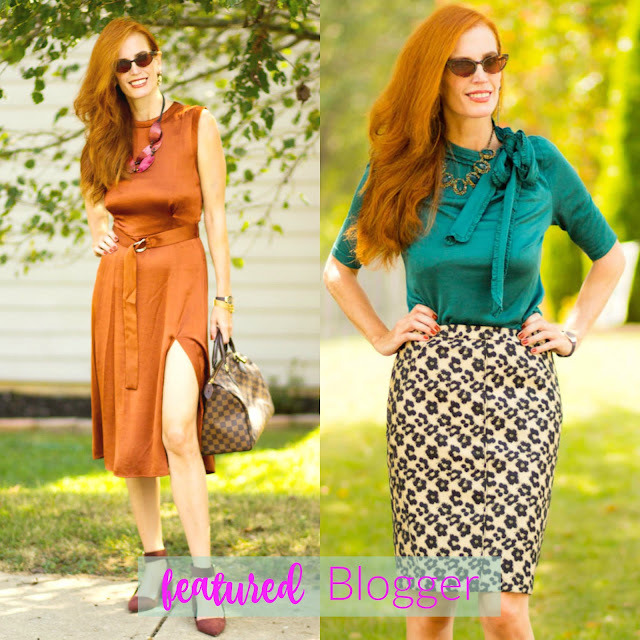 I have a very simple early Fall Outfit for you today. What do you wear on a Sunday morning when it is semi-windy, in the mid to high 60s? Well for one, you can still wear sandals and show off a pretty+fresh pedicure (I had just gotten mine done), but to keep warm you stick with Skinny Jeans and a Light Chiffon Blouse. I have had most of the pieces in this outfit for years, except the jeans are new (from Forever 21 and under 10 bucks) and I paired all of these pieces with my latest three jewelry items from Rocksbox. Let me sing praises to these Dark Blue Skinny Jeans for a moment! Priced just under ten bucks, they are comfortable, easy to wear and stretchy enough to feel perfect on your curves. Because of their dark color they go with everything and can be dressed up or down. As a matter of fact now that I am typing this (on Wed Sept 28th), I am currently wearing these jeans. For today's outfit - which I wore a couple of weeks ago to go to brunch with my daughter at iHop - I paired my jeans with an Ivory+Tan Blouse. I love that the print is like an Abstract Plaid and it is fitted and sort of cropped. In the neckline it has a built-in skinny scarf/bow tie but I decided to let it untied. Since this outfit is made up of neutrals I decided to pop it with Colorful Accessories: Yellow Sunnies, Bright Coral Lipgloss, Coral Earrings, Orange Ring and Orange-Red Sandals. The Gold+Sparkly Crystal Statement Necklace and Gold+Black Sequined Mini Clutch dressed it up a little. What do you think? Ivory+Tan, Abstract Geometric-Print, Long-Sleeve Bow-Tie Chiffon Blouse: NY&Co. (Old) (similar, Huge Steal), (similar in black patterned, Great Deal, love this), (similar w/ double patterns, Splurge, my Favorite). Dark Blue/Indigo Stretchy Skinny Jeans: Forever 21 (New) (similar, Steal), (similar, on Huge Sale, love these), (similar, Splurge). Brown Sunglasses in Yellow+White Plastic Frames: Old Navy (similar, Steal), (similar, Great Deal), (similar, Splurge). Grayish-Blue Octavia Stone, Gold-Tone Ring: Pitaya (New) (drusy option, Steal, love this), (similar, Great Deal), (similar, huge Splurge, my Favorite). Gold Tone X-Ring: Sophie Harper via Rocksbox (New) (very similar, Splurge), (similar w/ silver pave stones, Great Deal, my Favorite). Orange-Red Lucite Thing Sandals: Old Navy (Old) (similar, Steal, love these), (similar, Splurge, my Favorite). Just like the previous week that I co-hosted with Shelbee, last week the two of us had a very successful big linkup too, with 150 outfits linked up. It is hard for me to narrow it down to 5 favorites (or less) each week but I manage it lol. 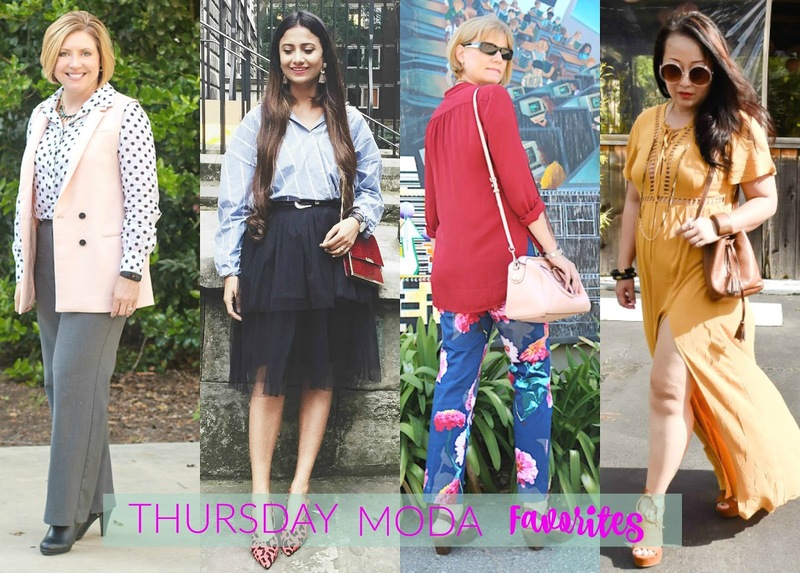 This week, the chosen ladies are mostly bloggers in their 40s and though the outfits I chose couldn't be any more different, each outfit is still stylish, beautiful and full of inspiration! This week's featured blogger is JESS from 'Elegantly Dressed and Stylish' and let me tell you the name of the blog suits her so well because Jess is exactly that: elegant, dressed up, stylish and polished. She linked up 3 outfits last week with this satin copper clay a.k.a. rust dress being my absolute favorite. I love, love the dress with that thigh-high slit and the matchy yet not-quite-the-same satiny brown shoes, LV classic bag, maroon statement necklace and brown sunglasses. The dress and shoes are stunning. I also loved another satin piece she wore - her emerald blouse - paired with a jacquard leopard pencil skirt. Jess always looks lovely in jewel tones and reds and wears them a lot. She also has a great collection of low-heel shoes and flats as well as gorgeous jewelry. Her ravishing red hair is her best accessory though. On Tuesdays she runs her own successful linkup named "Turning Heads Tuesday" which is meant for her because look at her amazing red mane! 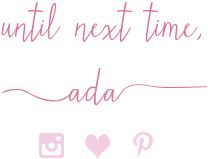 Make sure you stop by and see her blog if you haven't yet. Fonda is 'Blushing into Fall' paired with polka dots and grey. I happen to love light pink with grey. That vest is so sharp. Chichi's 'LFW Day 2 Outfit' is a hit with me and I bet Londoners loved it too. The oversized, sort of masculine blouse looks great tucked into the fluffy tulle skirt and those magnificent shoes - Love! Andrea's 'Floral Pants for Fall' are what I want (too bad I missed out on this print from Banana Republic). I love that she paired them with a burgundy-redish blouse and Fall-like sandals. Sheela's personal style and writing style has no 'Comparison' and she proves that in this Gorgeous Fall Mustard Maxi with fun little cutouts matched with Camel Accessories. Bold and Beautiful!